Want to know the scientific process agencies use to optimize their Facebook Ads? Unsure if your Ad is converting as well as it should? Or if you’re paying too much? Before you start your advertising campaign, you need to decide on your goal and find the proper metrics to track your progress toward it. For small businesses, I recommend using Website Conversions as your goal. This will allow you to see exactly how much a new lead or customer costs. And if you are able to pay less on Facebook Ads than a new lead or customer is worth to your business, then your Ads are making you profit. To learn more about calculating your average customer value vs. the cost of acquiring one through Facebook Ads, check out my recent article, Facebook Advertising Costs: CPC, CPM, CPA & CPL Guide. One of the keys to optimize your Facebook Ads is finding the right target audience. To do this, I like to break up my entire potential audience into smaller segments. I’ll then run simultaneous Ads for each Target Audience to see which one converts best. To do this properly, you need to make sure that your Target Audiences don’t overlap, or you’ll be showing the same Ad multiple times to the same people. This will not only skew your results, but be very spammy to your audience. As I mentioned above in section #1, the one metric you NEED to focus on is your your average-value-per-customer minus Cost-Per-Customer. You can monitor your CPC, CPM and CTR to make sure they aren’t out of whack, but at the end of the day you should only make changes and tweaks to your Facebook Advertising campaigns based on that one metric, not on anything else. Looking for ways to boost your click-through-rate? Want an easier way to generate new sales than trying to come up with the right Target Audience? Custom Audience and Lookalike Targeting are the answers. Does Custom & Look-A-Like Audience Targeting Work? An ecommerce company who targeted their email list found a 43% conversion rate increase among signups and a 30% decrease in cost-per-lead. SocialCode found that one campaign with a custom audience found a 15% lower cost-per-like. I can already send emails to my emails list for free. Why would I pay to advertise to them? The average email is only opened by about 20% of subscribers. And even less will click-through. So how are you supposed to reach these subscribers who have opted-in to your newsletter and are interested in your business? Custom Audience Facebook Ads are a great way to reach those 80% of subscribers who don’t open your emails, keep them warm and convert them. Learn more about custom audience and lookalike targeting for Facebook Ads. The longer your Ad on Facebook, the less people will read it. A recent study found that Facebook posts with 80 characters or less receive 66% higher interaction rates than longer ones. If you want to go even shorter (around 40 characters in length) you’re looking at around 85% engagement. While these numbers are for Facebook posts, News Feed Ads are basically the same format, so it’s a close approximation. 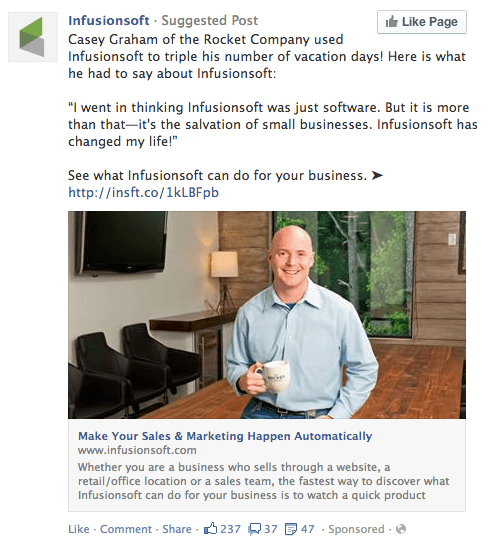 Here’s a recent News Feed Ad from Infusionsoft. While it’s a great case study for their company it includes 105 WORDS and over 627 CHARACTERS. When you have as much text as this Ad, most users will be overwhelmed by the volume and simply skip over it. Do you ever notice that your Facebook Ad’s click-through rate (CTR) starts going down after a few days? To combat this “Ad Fatigue” you need to change your Ad, or rotate it, to keep it new and fresh for your target audience. Rotate different headline copy, action words, image background colors, etc. The Ads don’t need to be drastically different, just enough to not look the same at a quick glance. As a general rule, I recommend rotating your Facebook Ad Creative (the image, copy and benefit/offer) or Target Audience before your Ad’s Frequency hits 8.0. What do you think? Anymore you would add to the list? Let me know in comments!